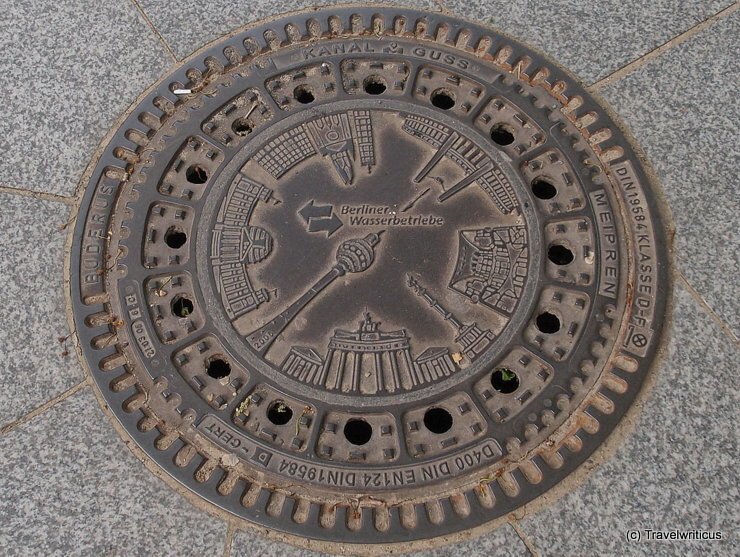 This manhole cover displays the main sights of Berlin. The buildings shown starting from the bottom in a clockwise direction: Brandenburg Gate, Television Tower, Reichstag Building, Kaiser Wilhelm Memorial Church, Olympiastadion, Federal Chancellery Building, Victory Column. 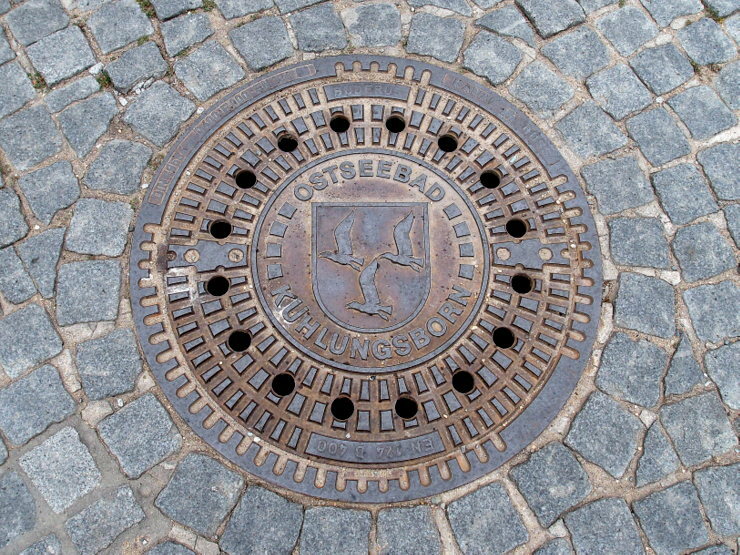 This manhole cover in Halle (Saale) displays the coat of arms of the city. The city arms of Halle consist of a moon between two stars of different size. The colour of these symbols is red, the ground is silver. 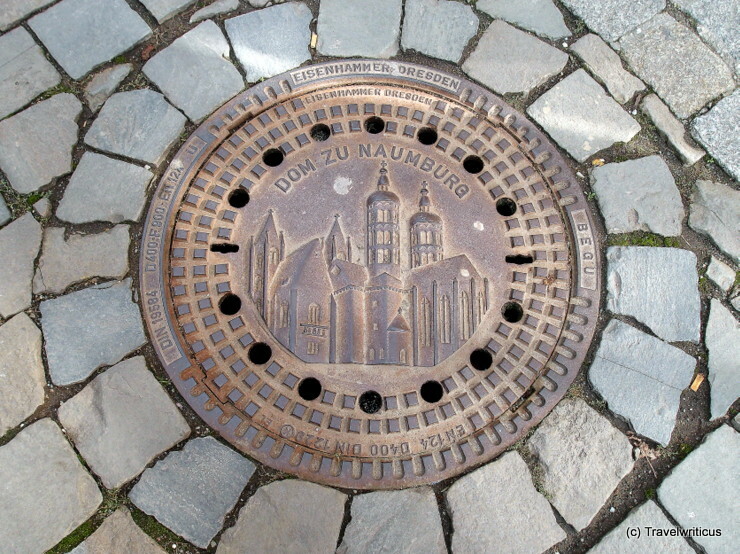 This manhole cover displays the cathedral of Naumburg (Saale). The German full name is Naumburger Dom St. Peter und St. Paul. The cathedral dates back to 13th century and is part of the tourist route Romanesque Road (Straße der Romanik) in Saxony-Anhalt. 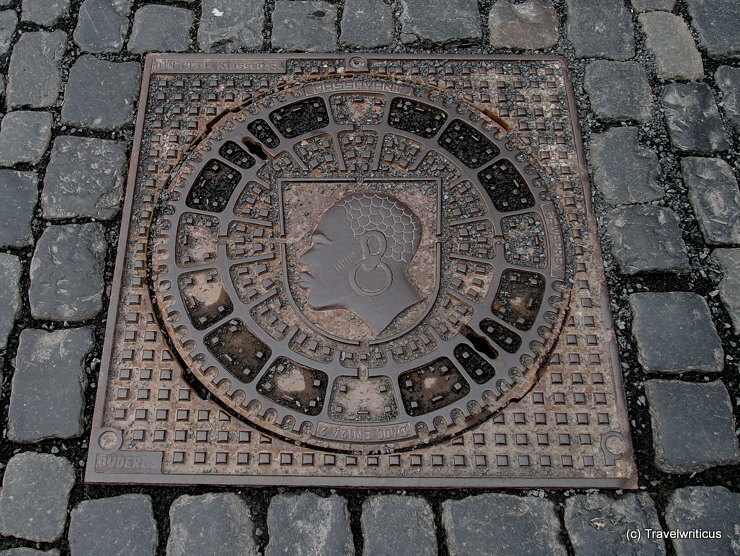 This manhole cover in Naumburg (Saale) displays the city arms. Interesting detail: Since 1993 the sword lays over the key. 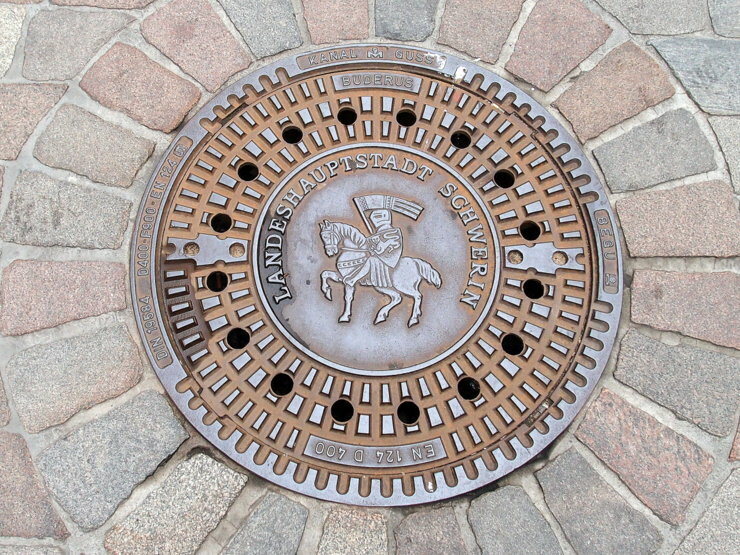 This manhole cover shows the older coat of arms with the key positioned over the sword. 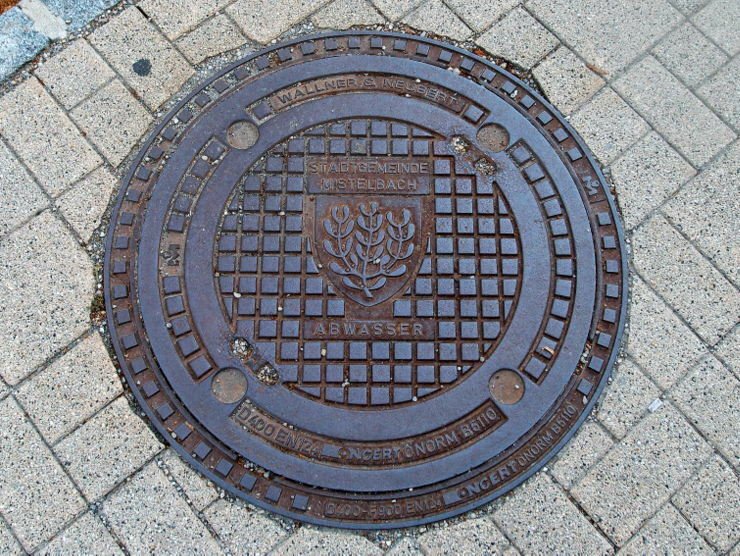 The manhole cover of Mistelbach shows a sprig of mistletoe, which is also the emblem of the city. The part ‘Mistel’ in the city name is actually the german term for a mistletoe. Schwerin is the capital city (LANDESHAUPTSTADT) of the German state of Mecklenburg-Vorpommern. 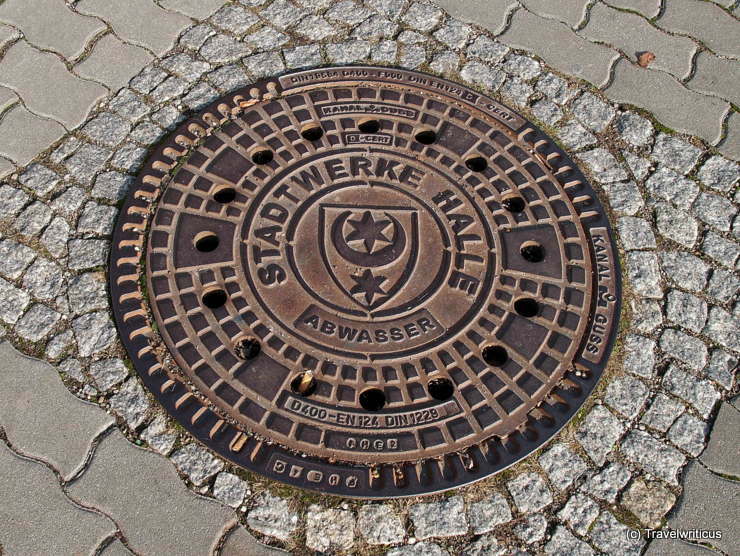 The manhole covers display the city arms in the style of 1991. The knight symbolizes Henry the Lion (Heinrich der Löwe). 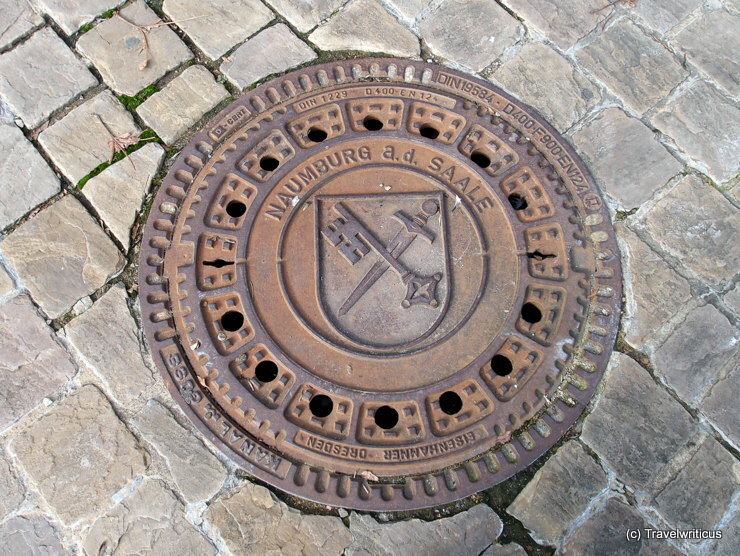 The manhole covers in Kühlungsborn show the arms of the city. The coat of arms displays three silver seagulls in a blue field. The title Ostseebad refers to the fact, that Kühlungsborn is a seaside resort at the Baltic Sea (Ostsee). 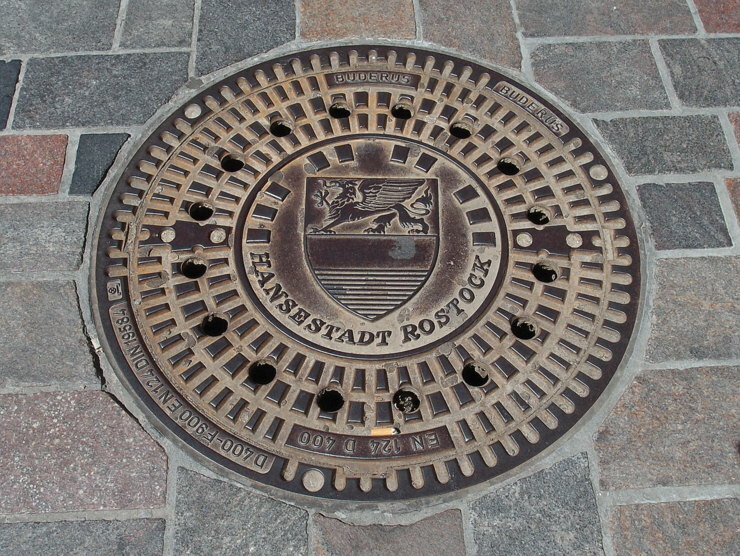 The manhole covers in Rostock display the coat of arms of the city. The coat of arms dating back to 1367 depicts a golden griffin of a blue field (representing the former princes of Rostock) with bars of silver and red (the colours of the Hanseatic League). As a member of the Hanseatic League the city is generally named Hansestadt Rostock. 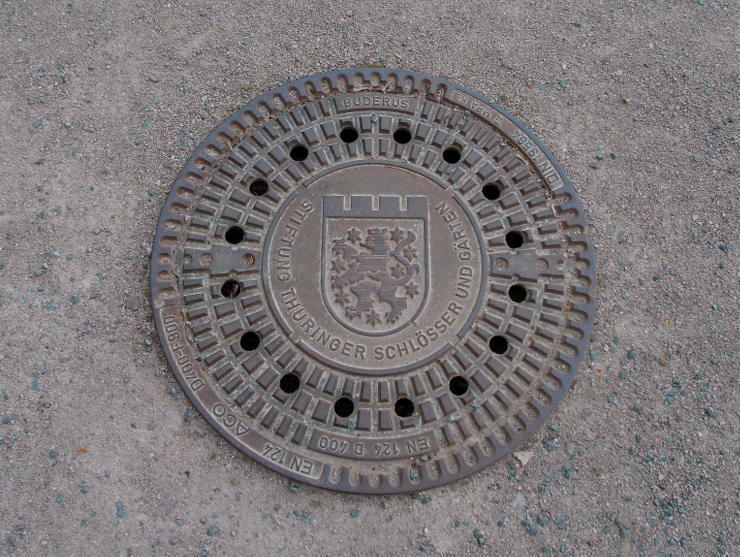 This manhole cover near Friedenstein Castle (Schloss Friedenstein) shows the coat of arms of Thuringia. The inscription promotes the foundation Thüringer Schlösser und Gärten, which is responsible for about 30 castles, monasteries and parks.